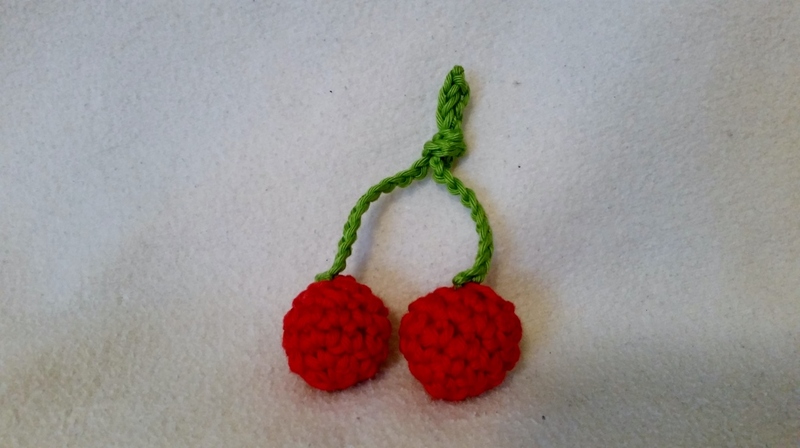 Instructions for crocheting two cherries with twigs. Of course, in addition to carrot, lemon and pumpkin, the cherries may not be missing in the fruit basket. Fill the cherry with filling cotton. Pull thread out, secure and cut off thread. Make a first loop with green. For the initial loop, leave some thread for sewing. Then chain 40. 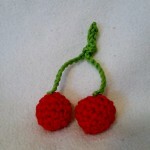 Knot both ends tightly and sew on one cherry at a time. Finally, form a knot in the middle of the chain.